We have covered the reasons for the political divide and the fact that the two sides do not effectively communicate with each other because they speak two different esoteric languages. This problem of lack of communication and understanding has been greatly acerbated in recent times. It goes beyond the natural differences in focus to a willful refusal to do anything to reach any harmony or compromise with the other side. This is evidenced by the fact that the voting in Congress has been close to 100% different on each side. This has not only happened with major legislation such as Obamacare as well as its repeal, but even with the recent Supreme Court nominee, Neil Gorsuch, where the vote was basically along party lines. This is unusual as in the past party lines have been crossed to insure that the important vacancies can be filled, even though the nominee is far from their choice. The last conservative the Democrats embraced was Scalia in 1986. The vote was 98-0 to confirm. A new tone was set the next year when 54 Democrats voted to prevent Robert Bork from a position on the Supreme Court. This trend continued with the next conservative nominee – Clarence Thomas who was barely voted in with 46 Democrats voting against. As recently as 1993 all but three Republicans voted for Ruth Bader Ginsburg, perhaps the most liberal justice of all time. The attitude of cooperation from both sides has changed and we will not see much cooperation again unless the general public demands it. Casting their actual vote on election day has the most powerful effect. If voters reject those who are stuck on the extreme partisan position then our representatives will start turning around fast. The question that arises is what can be done to shake the politicians loose from their fixation on their bias and sincerely look for what is for the good of the country more than maintaining power for their party? What I think is in favor of the people is that there is still a majority in this country who do not lean to the extreme but sincerely desire to move the country ahead in a positive direction. These people normally do not raise their voices loudly or march in the streets, but quietly go about their lives in the hope that common sense will prevail in the end. This silent majority vote and that has been the main way that they have made their voices heard, but they could be roused to more action if they saw a way. I have introduced a plan that can harness the power of this majority that could take us back to ta rule by common sense. Here is the link. This is what you have been told. The big problem is that the vast majority of the people are polarized so much to the left or right that their judgment is affected and they cannot see the truth in the middle. Some are affected much more than others, but few there are that look to the left, the right and then the middle with an objective mind. 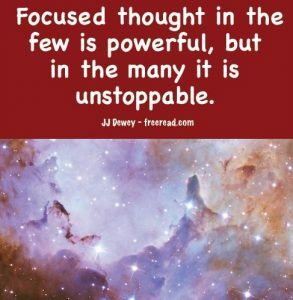 These few need to step forward and lead the battle toward common sense and a new Aquarian Age of liberty, justice, abundance and right human relations. I have written the Principles of Political unification, which is composed of twenty statements that most common people can endorse, but which our representatives and leaders need to absorb and apply in their own lives. A lot of the division we experience would be healed if we lived by these principles. (2) I support the principle of free speech. All shall be allowed to express their political and spiritual views, however repulsive, without legal restrictions. (4) I commit myself to sending good will and the spirit of friendship to all involved in the political process, especially those with differing political views. (5) Even though the majority may not always support my views, I realize that the majority, when properly informed, rarely will lead us on a dangerous path. I therefore seek to honor the majority will of the people. When I disagree with the will of the people, I will not seek to forcefully control them or change them, but will use peaceful means to inform, educate and enlighten them. (6) There are a number of issues that cause division, heated debate and anger; examples are abortion, gun control, climate change, social programs, drug legalization, military activities and others. Most cannot be resolved in the near future through the conversion of the other side to my side. I support the following unifying approach: to support the principle of fairness on controversial issues, both sides must be heard even though the other side may be repulsive to me. Free speech and thought is the most important principle and the prime directive of unification and ultimate peace. I therefore commit to the principle of fair play, realizing that both sides deserve to be heard and have their representatives in positions of power. Both sides should have freedom to present their views without legal restriction. Fairness is not to be forced, but allowed and tolerated. (7) I believe in integrity and honesty, and will seek to be truthful no matter what the opponents do. I seek not to distort or lie for the benefit of my party or for personal gain. (8) I accept that we must be fiscally responsible and will do all in my power to create a balanced budget, except in times of national crisis. I will only support programs for which funds can be raised without adding to the national debt. (9) I agree that the people are taxed enough and seek to keep the budget within the range of current tax revenues (or preferably lower) and to not raise the percentage of taxes on anyone unless the majority of taxpayers agree. (10) I agree to put the security of my country and the world above the views or actions of my own political party. If others of my party sabotage national security, or undermine a just effort toward the elimination of threats, I will be just as critical of them as the opposing party. (12) I accept and support the idea that we can save ourselves much grief by learning from the mistakes of history so we do not repeat them. It is therefore of extreme importance that the youth be accurately taught, without censorship, national and world history in a way that is of interest and will be absorbed by them. I will oppose all those who revise history in a distorted fashion for political gain or in support of a political agenda. (13) I agree that extremism has been and is the cause of many problems in the world and seek to not impose extreme views on the people. If I happen to have extreme views that I believe to be of value, I will seek to persuade by education rather than by force. It is also a problem when political opponents are called extremists when over a third of the public supports them. Such accusations are extremist in disguise. I seek to not be extreme myself in distorting the image of opponents by calling them extremists when such is not true. For instance, it is not extremism to be simply for or against abortion, as there are many on both sides of the equation. (14) I support the elimination of poverty but realize there are two approaches to this. The first is to give a helping handout and the second is to provide circumstances so the person may help himself. Extremists on this issue have warred against each other and have been the cause of much division. I reject extremism on both sides and seek to recognize the value of both sides. There are times of helplessness when people need direct assistance, and times when they need to be encouraged to stand on their own feet. I do not support handouts to those who are capable of helping themselves and refuse to do so. (15) I support the separation of church and state, but reject extremism on both sides. I reject the extreme that the government should endorse any specific religious influence on public policy even though all religions have the freedom to express their views. I also reject the other extreme that any mention of God, religious values, or the public display of religious symbols is not to be tolerated. (16) I support equal rights for all races, both sexes and members of all religions and ideologies. I recognize that the large majority of both sides of the political spectrum seek what is best for all races and minorities (even though the opposition has a different approach) and refuse to manufacture accusations for political gain. (17) I recognize that the large majority on both sides of the political spectrum seeks what is best for the environment, but, again, both sides have a different approach. Two extremes causing division are: the first is preserving the environment even if there is strong economic and job loss. The second is seeking profits at the expense of the environment. The truth is the two are interdependent. A strong economy can provide funds to help the environment and a healthy environment provides for a good long-term economy. I seek, therefore, to work with both sides of this issue and will desire cooperation rather than assigning blame. I seek to aid the environment without harming the economic structure. (19) I will support the establishment of necessary law as well as the elimination of bad, as well as useless laws that clutter the system. (20) In the end, I support the example of John Kennedy who, while campaigning, found good things to say about his opposition. Instead of tearing them down, he said, “we can do better.” I support the idea of converting by good works and ideas rather than tearing down the opposition, who represents approximately half the country, many of whom are my friends and neighbors. 1 The problem here with average seekers who are polarized on one side or another is that they will adore the initiates on their side of the fence, but completely miss what the Brotherhood is trying to accomplish with the opposing initiate. 2 A prime area where this battle between the emotions and the mind is being fought is between those who are black and white in their interpretations of philosophy and religious thought, and those who see shades of gray and points of truth between the two extremes. 3 The incorrect extreme for those seeking the Spiritual path is to seek unlimited wealth through teaching that elevates your status on the physical plane much above your students. 4 There are extremes in all things. 5 To see the point of truth between the two extremes of the Pendulum Principle takes another principle – The Principle of Discernment. 6 The true seeker will see where the true extremes lie and avoid taking a blind unthinking position on that extreme as he would a plague. 7 The sad truth is that many of the popular beliefs and positions of average humanity are extreme and lacking judgment. Some of these extremes are accepted as being moderate if popularized by the mainstream media. 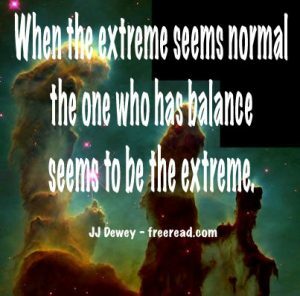 8 When the extreme seems normal the one who has balance seems to be the extreme. 9 When one extreme or the other is embraced then one does not have to make any decisions or do any thinking. Everything has been pre-formulated. 10 Is it extreme to believe that two opposing doctrines are both correct? Verily, yes – unless there is some good explanation that tells us of a misunderstanding. 11 Balance in the disciple often leads to the path of high resistance. 12 The extremist will become angry at a balanced point of view. 13 Because of a tendency to take a side where formula answers exist, the majority of people turn into extremists. 14 Almost all people, with the exception of high disciples and adepts, swing back and forth like pendulums and only take a passing peek at the true midway point as they swing by it. 15 It is the nature of almost all people to want to take a particular side, left or right, black or white, born again or new age. 16 One should always seek to fulfill the needs of their mate as long as their own needs are not sacrificed to an extreme and there is no harm done. 17 In seeking freedom of expression, people often go to the extreme and do not balance themselves with order as demanded by nature. 18 Some will read these words and take them to the extreme. 19 The religious right takes everything too seriously, and literally, and many on the left throw the whole Bible out the window thinking it is like kindergarten and needs to be left behind. 20 Many great teachers in the East have put emphasis on the overriding, control, directing and sometimes neutralization or elimination of emotion in order to reach higher states of consciousness. Many students have interpreted this to mean that we should “kill out desire” completely, move beyond it and never experience it again. This is an extremist point of view and as Buddha taught neither extreme is the path to liberation. 21 Just before a person truly develops the intuition and receives enlightenment and thinks inclusively, they often finds themselves in an extreme position because of certain black and white facts which seem to stare them in the face. 22 Most Identity people do not hate other races just as they do not hate animals, but view them with an extremely separative outlook and believe they are incapable of acquiring the attributes of godliness. 23 There will be times now and again when declarations of extreme import will go forth in the name of Christ or the Hierarchy, but this will be because of either the urgency of the times or special circumstances. 24 As the masses swing from one extreme to another a point of truth at the center is sensed (however dimly) and a yearning is created within the hearts of seekers to return to that point. 25 Separatist and elitist thinking doesn’t come from observing or describing what is, but by the distortion of what is. 26 Most people believe the mid-point to be a point between the two extremes of thinking and action because it is the norm. The problem with the standard equation of the norm is that it is a floating target. 27 He who stands in the true middle is seen as an extremist by the real extremists. 28 We have the same problem in our society with divorce as we do with abortion. The masses gather on the extreme views on one side or the other, instead of looking at both sides in the circumstance and making an informed decision. 29 If one moves too far a distance from the mainstream he will lose the support of the people even if he is one hundred percent correct. 30 Going to the extremes always leads to illusions and we can go to an extreme by living too much in the past, the future or the present. 31 The trouble with many people who influence society is that they are extremists. 32 Fanaticism of correct speech is indeed an extreme that will be due for correction in the near future. 33 Humanity swings back and forth between two extremes on a cyclic basis. There are larger and smaller cycles. Because there are cycles within cycles it may seem that there are times that a moderate extreme is followed by a greater extreme. But what is usually happening instead is that a lesser cycle is followed by the ending of a greater cycle. 34 The true extremists–probably over 99 percent of humanity–are those who have not found the middle way. 35 You must not be reading the newspaper, watching television or listening to radio if you do not hear and see people pointing fingers and labeling those who do not agree with them as extremists. 36 The person pointing the finger is usually more of an extremist than the one accused. 36 To obtain a desirable result there is always a wrong extreme on the left and on the right. On the other hand, there is always a way to achieve the goal. 37 When we look at all the alternatives between the two extremes, there is always a point of decision which is the most accurate. 38 The way of enlightenment is neither extreme, but between the two extremes.